You guys. It’s freezing! Literally. I’ve always considered myself a cold weather person. Summer heat always make me grumpy and winter chills always make me feel the coziest…until now, that is. Living in the south-east, I now know what winter really feels like and I hate to say it (mostly because I have no way out), but I’m not a fan. Not even a little. I admit, seeing snow fall and create a winter wonderland for the first time a few weeks ago was completely magical. But after the second snow fall, and then the third… I’ve had enough! 72 and sunny runs through my veins and I am California dreamin’ like nobody’s business. In the bowl of an electric mixer fitted with a paddle attachment, combine the flours, oats, baking powder, sugar, and salt. Blend the cold butter in at the lowest speed and mix until the butter is in pea-sized pieces. Mix in crumbled bacon. Combine the buttermilk, maple syrup, and eggs and add quickly to the flour-and-butter mixture. Mix until just blended. The dough may be sticky. Dump the dough out onto a well-floured surface and be sure it is combined. Flour your hands and a rolling pin and roll the dough 3/4- to 1-inch thick. You should see lumps of butter in the dough. Cut into 3-inch rounds with a plain or fluted cutter and place on a baking sheet lined with parchment paper. Combine the confectioners’ sugar, milk, maple syrup, and vanilla. When the scones are done, cool for 5 minutes, and drizzle each scone with 1 tablespoon of glaze. The warmer the scones are when you glaze them, the thinner the glaze will be. Top with reserved bacon crumbles. 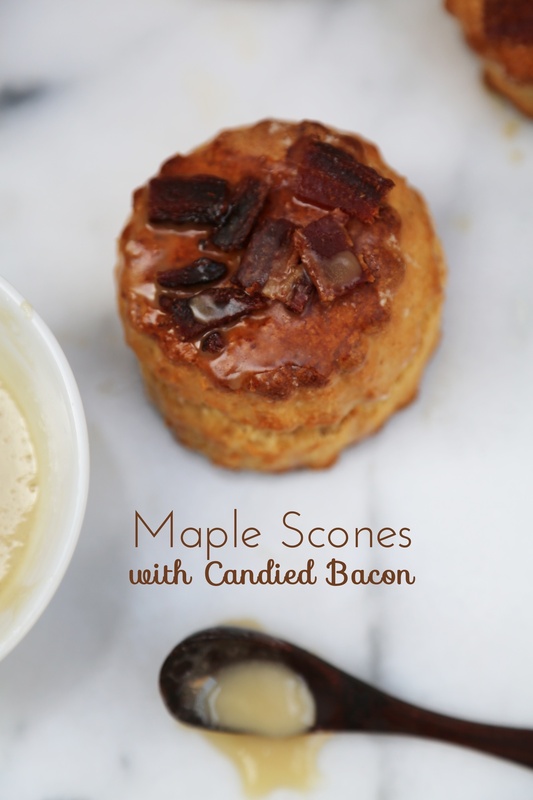 You had me at candied bacon! These look GOOOOODDD!! I saw the episode where Ina Garten made these, they’re still bookmarked in my recipe box. Yours look wonderful! I’m sorry you’re not feeling the weather, I live in Michigan so this -20 windchill we’ve been getting this week is just par for the course for us lol. Great post! Oh my goodness… I need to have one of these. More than one. Two or three… or all of them!! They look so delish.. Wonderful recipe! I have been wanting to make blueberry scones for a while… forget that now! Thank you for sharing! OMG, THESE LOOK SO GOOD. Have to make these for the kiddos! Oh my… I hope I have the ingredients to test these out this weekend or I’m going to have to go shopping! They look delicious! Wow! If only we lived next door! Oh, this is all kindsa wrong! I cannot wait to make these this weekend!! WOW! I’m with you on the weather. I’m from sunny California going to school in Washington and there is definitely some sunny dreamin’ going on! These look good! Oh my GLOB! They look delicious! I’ll have to make them. :) It’s freezing here where I am too…so I feel your pain. We’re finally getting hit with the rain here CA. 4 straight days. Can these scones cure the rainy blues too? god these look so dangerous! you’re a genius! 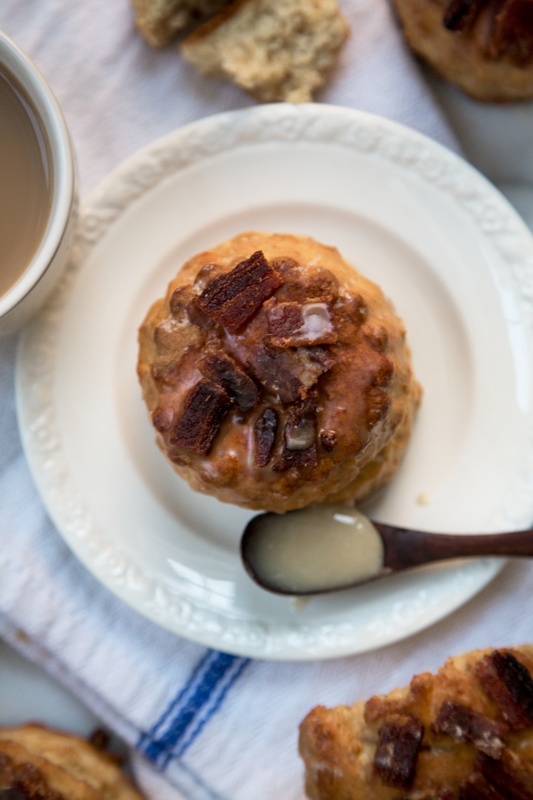 Oh these remind me of mini scone like cakes that my grandparents would make from the pork drippings. Sounds gross, but gezz they were tasty- love the sweet addition!! These look absolutely devine! I love all things sweet and especially all things bacon! If it wasn’t for my love of BBQ, I would have been a baker. I definitely need to give these a try! yum!